Upon your initial look at Sinestro you'll notice immediately he is much taller than his wave 3 release. So far, so good. He's built with a combination of parts from Deadman and the previous Sinestro release, but does seem to add a new upper torso piece. The slimness of the Deadman body is appropriate and combined with the new upper torso, makes Sinestro a smidgen taller than Hal. One thing I really dislike is the use of the old Sin's forearms. They're much too short and conspire against the added height, not to mention they are on backwards. Or rather, the left forearms on the right arm and vice versa. That's not overly difficult to correct, but after completing work on my corrected height SC Sinestro, I haven't been in the mood to dismantle figures. This set was released just prior to the release of the spin off "Green Lantern Classics" line, but I assume Mattel already had the parts for that line tooled. So I don't understand why they couldn't use the forearms from the (incorrectly named) Black Lantern Abin Sur figure. His forearms are long and thin and feature five-segment bracers, just like Sinestro wears, hence why I used them on the Sinestro Corps version. 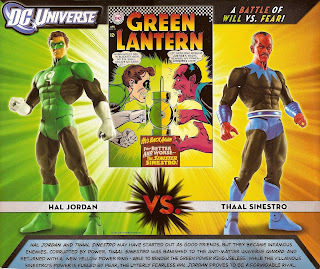 As if a corrected height Sinestro (albeit in his Silver Age costume) wasn't enough of a selling point, Mattel decided it would be best to pair him with yet another Hal Jordan figure. If you own the wave 3 Hal (or "World's Greatest Super Heroes" reissue, TRU/All-Star reissue, the gray-haired version from the "Green Lantern's Light" set, etc.) you know what you're getting sculpt-wise. But this version of Hal features his Silver Age uniform with metallic green, glossy black and pearly white paint. Plus, his eyes are painted brown as opposed to the tradition masked superhero look of completely white eyes beneath the mask (i.e. Batman, The Phantom, etc.). The eyes along with the slightly tweaked GL symbol on his chest make him more of a "Super Friends" version. That's cool, I guess, if you're into that. I wasn't overly excited to own this particular version, but I decided to use this body for the spare Naut Kei Loi head from the Medphyll/Naut Kei Loi figure. Mattel's DC Brand Manager, Scott Neitlich (a.k.a. Toy Guru), also stated that this set would include a "ton of accessories." I'd say that was a fair statement. Obviously, it's nowhere near a ton, but there are plenty. Each character received three accessories in their corresponding energy's color. Hal Jordan's constructs of will are in green, while Sinestro's constructs of fear are in yellow. All of the constructs are reused from previous figures with the difference being that these accessories have been cast in semi-transparent plastic to achieve their "hard light" effect. Hal's wrecking ball comes from Metal Man, Iron (wave 12) and his machine gun is borrowed from fellow GL, John Stewart (wave 11). 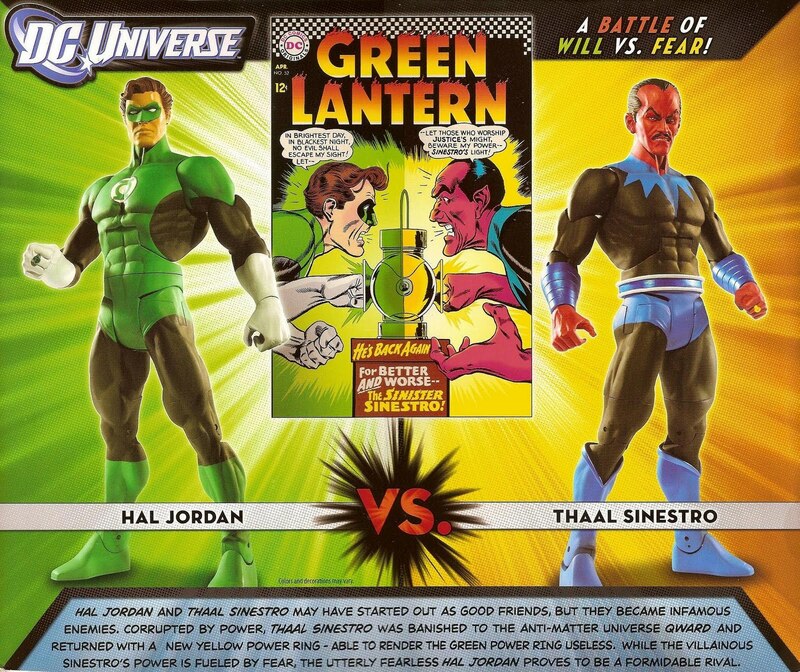 Both Hal and Sinestro each receive one of Metal Men leader, Gold's (wave 14) accessories. Some adjustments were made to insure that each accessory fit snugly on each figures respective ring hand. Sinestro's ax is particularly versatile as it also fits onto the SC members left arms. Sinestro also received one of Iron's accessories, the adjustable wrench construct, also made to fit over his left forearm. Sinestro's third accessory is a loose construct in the form of a mace. It was borrowed from Hawkman (wave 6) and is a bit thin for Thaal's open right hand and ends up sliding down. I corrected that by wrapping one of those clear packaging bands around the handle. The seventh accessory in the set is a repainted GL power battery. This one painted half green and half yellow. It's molded after the lantern featured on the comic book art displayed on the package. It works for recreating the poses in those images and not much else. By now you may know this set is a Toys R Us exclusive and they price it so. At $35 it carries a hefty price tag, although if you go by TRU pricing for DCUC figures, it's on par. Considering the amount of reuse in this set, it should have been priced about $10 cheaper. Although we finally get a corrected height Sinestro, it's not in his much more popular Sinestro Corps uniform and I think that's why this set has clogged the shelf space at my local TRUs. I'd recommend waiting for sale before buying this two-pack, but TRU never has DCUC sales, so you may have to look out for a coupon. If you don't already have two (or three, or four, or FIVE) Hal Jordan figures and you're a big fan of his & Sinestro's Silver Age looks, you should be pleased with the set.